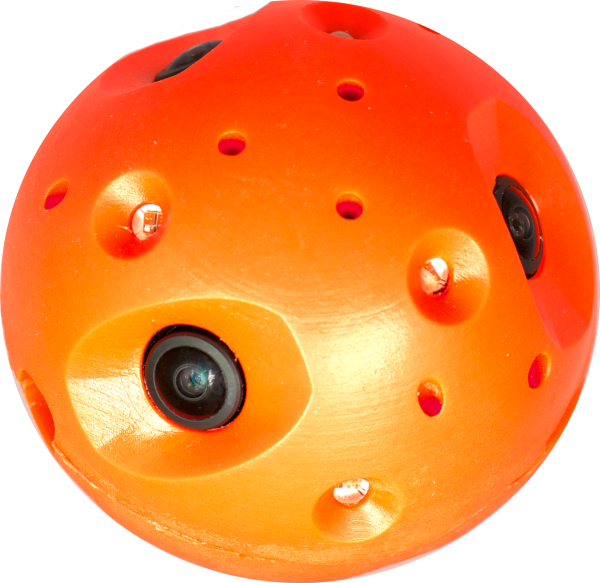 Throwable, omndirectional tactical camera that transmits real-time 360-degree/video to multiple users in real-time. See SPECS page for more details. Identical to the Tactical edition but adds dual high-gain microphones to capture audio along with the video. See SPECS page for more details. Identical to the Tactical Audio Edition, but adds an additional 4G-LTE modem for unlimited range when in a 4G coverage area. Verizon service and cloud relay service required. See THIS POST for more details on 4G and other connection options/configurations. High-strength and lightweight, our 3-D printed carbon-fiber custom mounts fit ANY vest, ANY dog. Any Explorer camera can be used as the best and only stabilized, omnidirectional K-9 camera in the world, while retaining all the multi-use flexibility of the Explorer camera systems. Like the Explorer cameras with the custom K-9 mount, the Cave Canem system provides the only stabilized omndirectional camera system in the world for K-9s, for the safest situational awareness for multiple team viewers and the K-9 handler. However it is lower profile and half the weight of the camera + mount system and has a wifi antenna that is better optimized for dog-mounting (giving the system better range). It can still be used as a 360-degree polecam, but cannot be thrown. Custom 3-D printed in high-strength composites like carbon fiber, so fits ANY vest, ANY dog. When plugged into a compatible iPad/iPhone or Android device*, extends the range at which that device can receive video over Wifi from any Bounce Imaging system by up to 300%+. *Requires ability to set IP address and ethernet support, which are available on most iPads, iPhones, and some but not all Android devices. Contact us for more information.